Join us in celebrating one of America's great parades on Thanksgiving morning, along with our friends from the clever social media parody "corps," The Couchmen Drum and Bugle Corps! 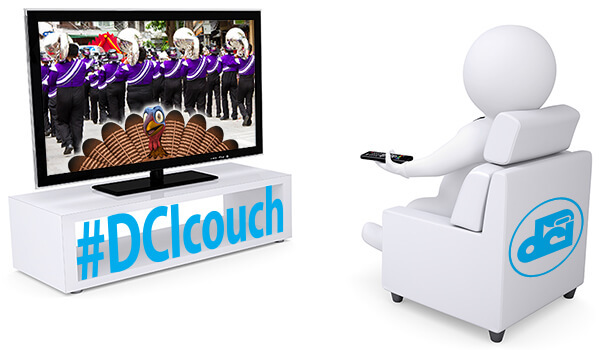 Along with helping the Couchmen to fulfill their mission of "seeking to provide the easiest drum corps experience imaginable," we're inviting fans of DCI and its member corps to chat together on Thanksgiving morning while viewing the Macy's parade from the comfort of their own homes. Several of DCI's touring ensembles will be joining the online fun for what will inevitably be a lively discussion and a lot of fun on Facebook and Twitter using hashtag #DCIcouch. Drum Corps International on Facebook. Drum Corps International (@DCI) on Twitter. Besides having fun while admiring the spectacle and the marching units taking part in the Thanksgiving parade, DCI will also be gathering information on a new service being tested for possible use during the 2014 DCI Tour. By "checking in" for this virtual event, fans will get a preview of the DCI Nimbit platform which is currently being evaluated to help extend the capabilities of the DCI Fan Network. "We are working to make audio from live performances available to drum corps fans faster and easier than ever before during the summer drum corps season," DCI Director of Marketing Bob Jacobs said. "Although our experiment on Thanksgiving won't feature live performance audio from the parade, there will be outstanding DCI performance audio available for purchase and download. This test will provide us with invaluable insights into the feasibility of using such a platform in the future." Fans who check in will even get the chance to take advantage of discounts and special offers, including the ability to download digital audio files from the 2013 Drum Corps International World Championship CD set, DCI's "Silver Bells" holiday collection and more. Join the fun on Thanksgiving morning! Check in at Fancheck.in/DCI and join the discussion on Facebook and Twitter during the parade!